Lake Atitlan, located in the Guatemalan highlands at 1,585 metres, has been described by the writer Aldous Huxley as 'the most beautiful lake in the world'. The lake, 20km long by 15km wide and reaching depths of 325 metres, is surrounded by the majestic volcanic peaks of Toliman, Atitlan and San Pedro, making for a spectacular sight during daylight and at sunset. The surrounding villages and towns, including Panajachel, Santa Catarina, San Juan La Laguna and Santiago Atitlan, are populated by native Mayan peoples who maintain many of their traditional practises, costumes and beliefs. A boat ride can take you to various villages to learn about the lives of these indigenous people, with the shrine to the Mayan god Maximon in Santiago being particularly popular. 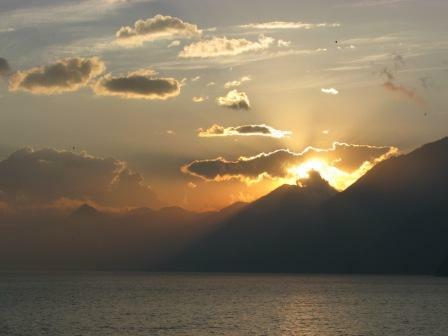 Organised group tours: Click here to see 6 tours to Guatemala which may include Lake Atitlan.